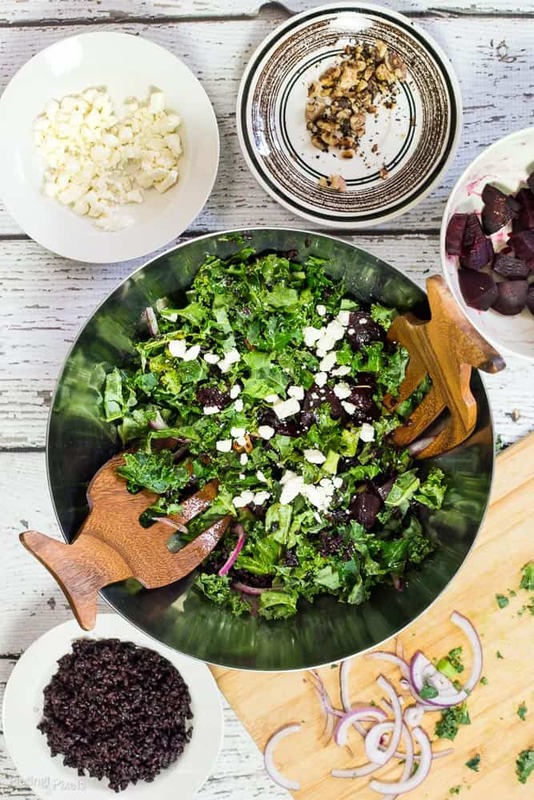 Healthy and balanced kale salad with roasted beets and black rice full of earthy, nutty flavors. Red onions, toasted walnuts plus a mustard cider vinaigrette for bold flavors. 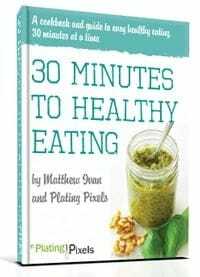 With this recipe, you’ll make an easy salad that’s full of nutrients, minerals, antioxidants, and fiber. Plus you’ll learn why you should be cooking with black rice. 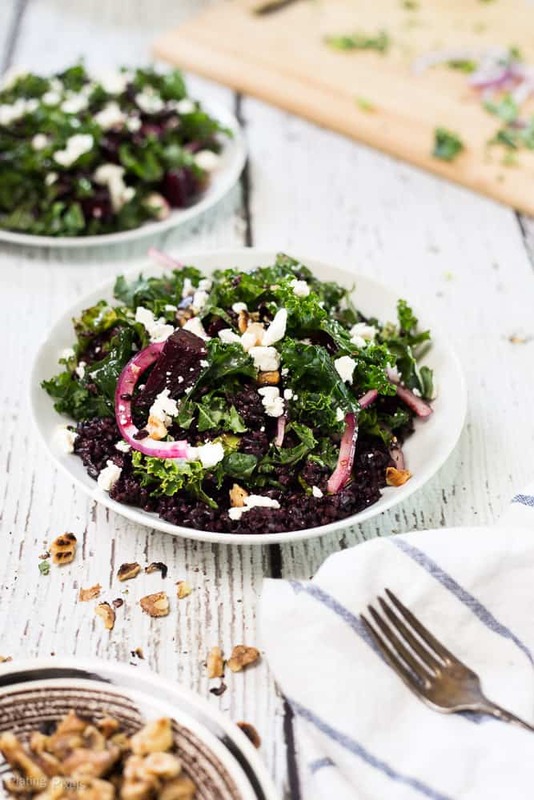 Take this Kale, Roasted Beet and Black Rice Salad is made with just s handful of clean, unprocessed ingredients (including homemade mustard cider vinaigrette) for a filling, balance side, or even an entree. Roasting vegetables, such as beets, brings out a caramelized sweetness while making them tender in the process. 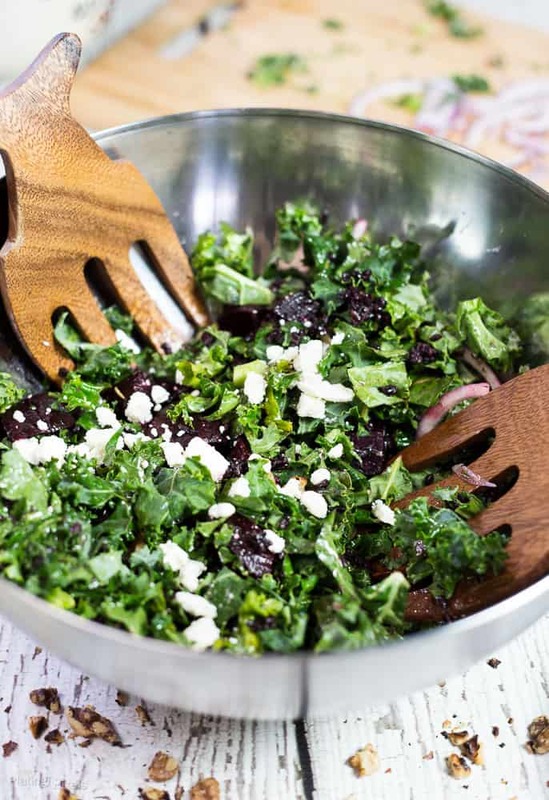 This brings a whole new dynamic to this kale salad and complements the soft texture of black rice. Add a tangy homemade mustard cider vinaigrette, toasted walnuts, and feta cheese (omit for vegan) and you have a wholesome, balanced start to the new year. Roast beets in the oven until tender. Meanwhile: In a medium pan, cook black rice on high until boiling. Reduce heat to low, cover and simmer 30 minutes. Remove from heat and let cool. In a large bowl toss kale, roasted beets, cooked rice, red onion, feta, and walnuts. To make the vinaigrette: Whisk together remaining ingredients from olive oil to pepper until well combined. Pour over salad and toss to evenly coat. Roasting beets is very simple, cut off the leaves then wash, dry and cut them in half (this reduces the cooking time). Wrap the beets tightly in foil and roast in a hot oven. For this recipe, the beets should be cooked through in around 40 minutes but to check they are done simply try inserting a sharp knife into the center of the beets. If you can insert the knife with ease they are done if not they’ll need a little longer. Pro tip: Take care when opening the foil wrapped around the beets as they’ll contain hot steam and can burn. Black rice is naturally grown and comes right off the straw that way. The rich color comes from a large amount of anthocyanin, a powerful antioxidant that causes color in most dark plants, including veggies such as eggplant and purple cauliflower. The darker the color of grains or veggies, the more antioxidants, and nutrients. Because of this, black rice is full of antioxidants, vitamins, minerals, and fiber. Yes, kale can be eaten raw and is a superfood that’s packed full of vitamins, minerals, and antioxidants. Kale can be quite hardy unlike most leafy greens so I recommend to finely chop it when eating raw. Pro tip: Toss the kale or salad with vinaigrette about 10-15 minutes before serving. The acids in vinegar will help break down and soften the kale. 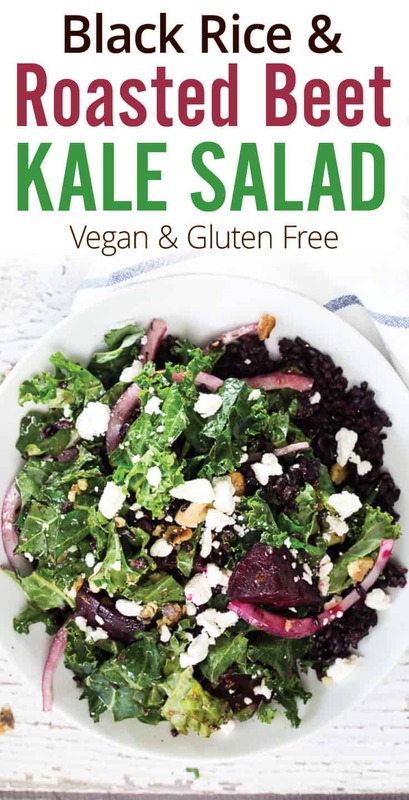 Healthy and balanced kale, roasted beet and black rice salad with earthy, nutty flavors. Preheat oven to 400° F. Remove leaves, cutting into main part of beet. Rinse and half beets, then wrap in foil. Roast on a baking sheet for at 40 minutes or until tender. Remove from foil and allow to cool, chop into cubes and set aside. Meanwhile: In a medium pan, heat 1 ¾ cups water, 1 cup Village Harvest Black Rice and salt to taste on high until boiling. 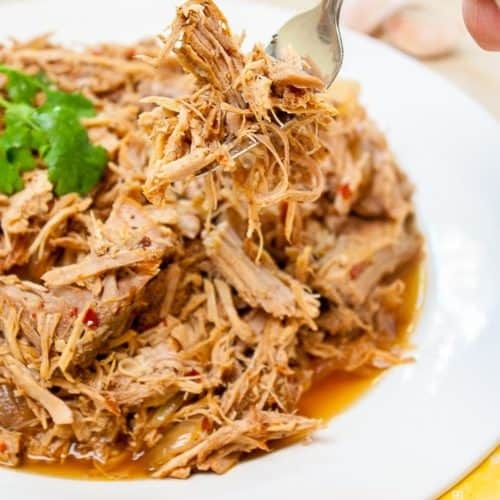 Reduce heat to low, cover and simmer 30 minutes. Remove from heat and let cool. 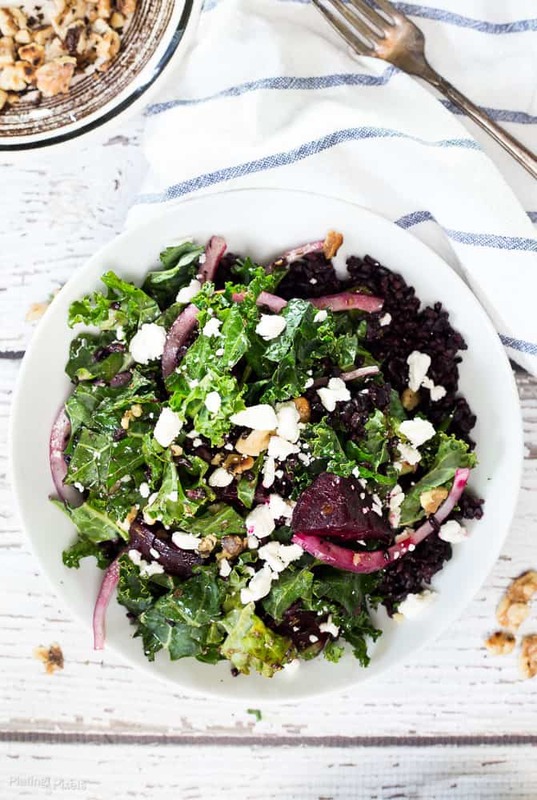 In a large bowl toss kale, roasted beets, cooked rice, red onion, feta and walnuts. To make vinaigrette: Whisk together remaining ingredients from olive oil to pepper until well combined. Pour over salad and toss to evenly coat. If making the vinaigrette in advance put all ingredients in a mason jar and shake to combine. This makes it easy for storing in the fridge. 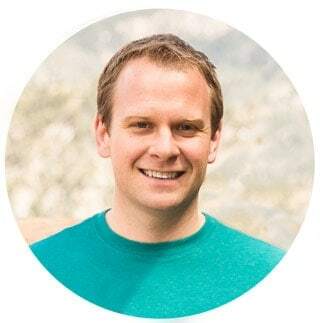 Matt, your recipe offers an enticing contrast of flavors, especially with the feta! This would be tasty with an un-oaked Chardonnay from the Santa Cruz Mountains or Monterey County. Yum! I’ve cooked with black rice once before and it was when I made a chicken and rice soup and it turned the whole thing purple! This salad sounds delicious. Haha I did the same thing with purple cabbage and chicken. It’s best to cook separate. Thanks Carly! Kale, beets, walnuts and feta. Man I need to hit the stores and whip this bad boy up. It sounds SOOOO good!!! I have been all about big salads lately, and I love adding some sort of grain to my greens. Never tried black rice, but I’m on it! This is such a good-looking salad, so hearty and healthy. Feta + salad = love. 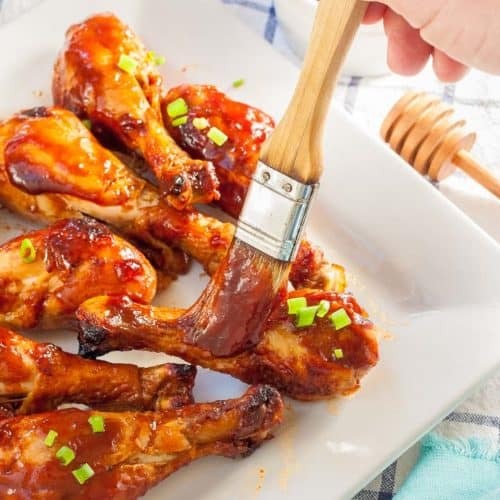 This is an awesome recipe, thank you! Was new to it too and I highly recommend it! Enjoy Tara! This salad looks so delicious and nourishing! 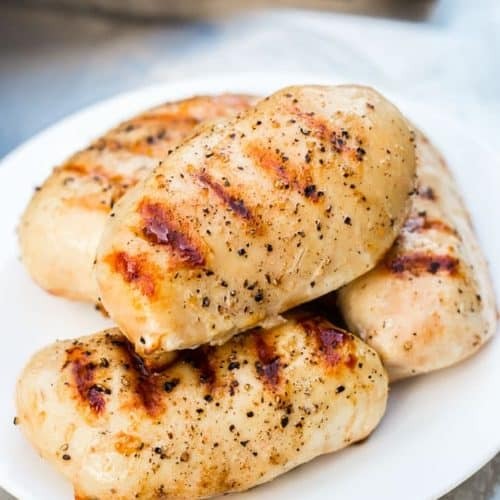 It would be perfect for lunch or dinner! Thanks Jillian! It’s pretty universal, so enjoying it any time is good! Looks beautiful and delicious. I love roasted beets! I’ve never tried the black rice, but I will now. Thanks so much Tina! You totally should, it’s amazing. It sure is! Thanks Kari! Stunning photos and YUMMY salad! I can eat this everyday! Thanks so much Mahy! Haha that’s probably a good idea. This looks so delicious! And your photos are absolutely stunning. That’s so nice and thank you so much Cassandra! Thanks for showing us this wonderful salad creation, using some of our favorite power foods! We love it all!!! I totally is. So much good for you stuff in here. Thanks! Yum! I just bought a whole bunch of beets and need to use them, thanks for the inspiration! You can definitely add plenty to this. You’re welcome and thanks Sarah!